A hot job market and the increasing cost of tuition have slowed the growth in the number of Kansans earning a college education nearly to a halt. Educators are worried that will worsen shortages of high-skilled workers and impede prosperity long term. Kansas’ public colleges and universities granted 40,856 undergraduate degrees and certificates last year, according to the latest progress report from the Kansas Board of Regents. That's virtually the same as five years ago and well short of the state's goals. 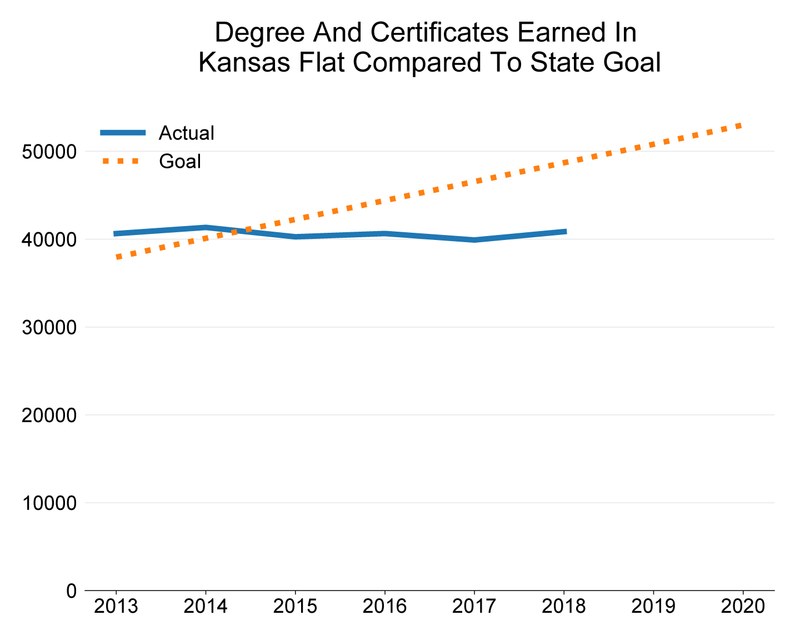 The number of undergraduate degrees and certificates earned in Kansas is well below the goal set by the Kansas Board of Regents. Kansas is nine years into the 10-year “Foresight 2020” plan designed to increase the number of Kansans getting post-secondary education and to better align state college and university programs with economic needs. The Regents have found some success, particularly in technical education. An initiative started in 2012 greatly increased the number of Kansans earning college credit before they graduated from high school. More than 10,000 students participated last year. And many of those students have continued technical education programs after high school, contributing to the growth of technical colleges by more than a third from 2012 to 2017. Yet most of the state's other colleges and universities have gone the other direction. The headcount at community colleges shrank by 12 percent between 2012 and 2017. State universities grew less than half of a percent, with many seeing declines. There are likely not enough students currently enrolled for the main objective in Foresight 2020 — more than 53,000 degrees and certificates earned by the end of this decade — to be achieved. Much of the declining enrollment at Kansas colleges and universities is among white students. Their enrollment numbers have dropped 12 percent since 2010, according to data in the Foresight 2020 progress report. Enrollment by Hispanic students has grown the most, by more than 42 percent. The progress report blames several factors outside of the Regents’ control, including the Kansas economy. The low unemployment rate means Kansans are able to find jobs without a college degree. In the early days of the recovery from the 2008 recession, college enrollment increased in Kansas as elsewhere. Unemployed Americans decided to go back to college instead of hunting for non-existent jobs. The reverse was true as the economy continued to improve. In 2013, enrollment in Kansas colleges plunged as the Kansas unemployment rate hit 5.3 percent. But while more Kansans are now employed, many remain shut out of high-skill, high-paying occupations that offer a pathway to the middle class. “A high school education is not going to cut for economic prosperity,” Ginther said. Ginther and others also worry that high-skill industries such as aerospace manufacturing that Kansas is trying to foster will experience increasing workforce shortages without more Kansans completing a college education. Rising tuition has also driven students away from Kansas schools. Students have born more of the cost of their education at public universities as the state repeatedly cut over the past decade. Higher tuition could be an outsized barrier for poorer students. The number of Pell Grant recipients at Kansas universities, students receiving grant money for college from the federal government, has been declining since 2015. Studies have shown a link between increasing tuition and decreasing enrollment, though there are disputes over the size of the effect. What’s indisputable is the massive leap in cost colleges have seen over the years. At Kansas State University, the sticker price for a semester has increased 57 percent over the last ten years. "When I started at K-State in the late ‘60s I paid out-of-state tuition and was able to work my way through the university with summer jobs and employment through the school year," said Pat Bosco, the vice president for student life at Kansas State University. "That's no longer the case now."